I'm glad someone thinks these things are worth $2,000.00. I just re-upped my PS+ subscription and am terrified for Sony regarding the recent hacking. The whole company could be in danger. I don't know, when I hear something is extremely limited but "for the fans" it never makes sense for me. For if they really wanted their fans to get their hands on it wouldn't making it so it was easier for them to achieve ownership of be part of the idea? If Sony really made this "For the fans" and wanted fans to have it then why isn't it sold worldwide in stores so people can actually get it not those few people across the world with thousands of dollars to spend on a console. It would be like if i wrote a book and then said i want everybody to be able to read it and then sell it for $300 each but i only printed 9 copies. Yeah, that line erks me. They made an extra $1.23 million in gross income extra compared to selling 12,300 regular PS4s. Take away the money spend to mold the different color plastic, etch/silkscreen the PS logos and the advertising costs and they probably made an extra $1 million on this. They knew the limited edition would sell out instantly and many would end up back on sale at a major markup within days. That's not their fault, but saying "for the fans" is a little patronizing. If they really made it "for the fans," it wouldn't have been nearly as costly and they would have made at least a few hundred thousand units that shipped all over the world. Also, what about the fans who bought every PS since the 90s, but either already got a PS4 and isn't filthy rich or can't even afford one yet? They could have at least sent all PSN users some exclusive download to also celebrate those 20 years. I've owned a PS1, several PS2's and a PS3 over the years but i guess im not a fan according to them so i can't pick up one of those consoles in a store, all i got was an email linking me to there store thing to download a free 20th anniversary theme for my PS3, thanks Sony you spoil me as a costumer for so many years. or more accurately, "For the fans... except the ones in Australia". Seriously, NONE for sale in Australia. EB Games were given 20 to give away in a competition, Sony Australia are giving away 20, and JB HiFi was given 10 to give away in a competition. A total of 50 consoles for all of Australia, none of which were purchasable. They couldn't even secure 400-500 consoles for us? seriously? out of 12300? Even Canada got a separate allotment for purchase, even though they could have quite easily purchased any of the thousands that were available in the US. Everyone knows the chicks in Australia are so hot that none of the guy shave time to play video games. They should just make more interesting editions and sell them outside Japan. There are so many cool designs that surely some people would buy if they just had (reasonable) access to them. So it's the same as with the Amiibo shortage thing: you "honor the fans" by creating a demand for a limited supply. 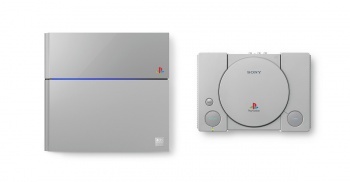 I can sort of understand Sony not wanting to make these PS4s too expensive, but honestly they missed out. If these sold for $1000, I'm sure people would have still bought them, and then all the profit wouldn't go to scalpers.